Toast the whole hazelnuts until fragrant, about 5 minutes. Rub the skins off and coarsely chop the hazelnuts. Combine the cream and sugar in a large saucepan and bring to a boil over medium heat, whisking often to make sure the sugar dissolves. Decrease the heat to low, add 6 tablespoons of the butter, and let it melt. Remove the pan from the heat and add 6 ounces of the chocolate. Gently shake the pan to submerge all of the chocolate and wait 1 minute before whisking smooth. In a medium bowl, whisk the eggs with the orange zest and rum. Slowly whisk in the chocolate mixture in a steady stream, scraping out the pan with a rubber spatula. 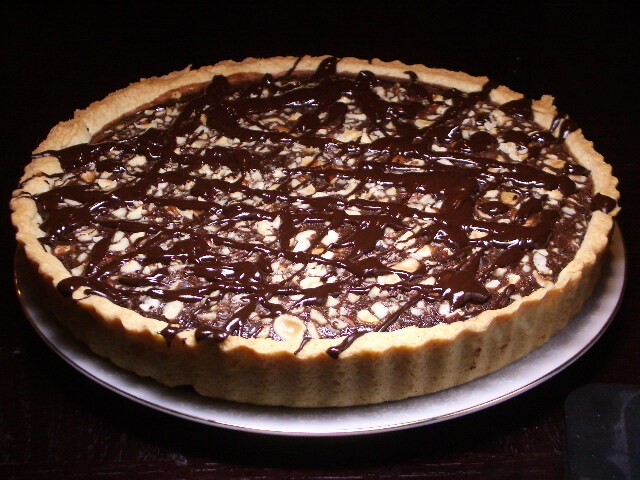 Pour the chocolate filling into the tart crust and scatter the chopped hazelnuts on top. Bake the tart until the crust is baked through and the filling is set and slightly puffed, 25-30 minutes. Cool the tart completely on a rack. 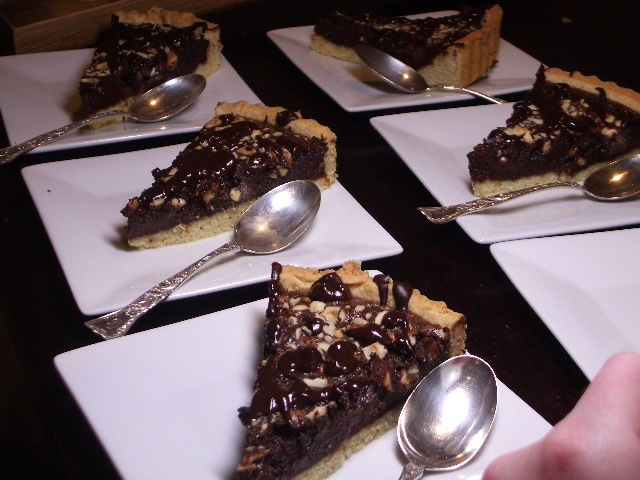 While the tart is cooling, melt 2 ounces of bittersweet chocolate with 1 tablespoon of butter. Pour this chocolate and butter mixture into a zip-top bag. Snip off the tip of the bag and decorate the top of the tart with a series of random parallel lines. This recipe (and the dough recipe!) came from Nick Malgieri’s Modern Baker. SUCH a good cookbook.